I found that the Back-UPS RS 800VA meets my needs for a power backup system.The unit will supply power to my PC for about 10 minutes before placing the PC into XP Hibernation mode, there is 5 minutes of backup power left at this point.This unit also protects the PC from power surges. 1) That the 3 Nema 5-15R outlets power is not controlled by the units front panel on-off switch These outlets are surge protection only, the four battery backup outlets are controlled by the on-off switch. 2) Unit is noisy.I don't know if this noise is coming from an internal fan or from the AC power converter. AWESOME!! !A great battery backup from APC!!! I have had this UPS for about a year and a half now and LOVE it!! !I just upgraded to the BACK-UPS 1000 (review to follow in about a month or two) and am now using this to backup my DVR, DVD recorder, and television.I could not be happier with this product!APC has some great stuff and I have had several different brands of UPS's.This one, the BACK-UPS 500, is probably their most popular.It's powerful, affordable, and VERY reliable!! !Give it a try -- You WILL NOT be dissappointed. The UPS unit itself works just fine. It kicks in properly when power fails, allowing me to save my work and safely shut down my computer. It even automatitcally shuts down the computer when I'm not available to do so myself. Having said that, APC's customer support is downright horrible. I contacted them concerning an issue with a recent software upgrade, explaining the situation in some detail (two paragraphs) and asking for a possible resolution. I received a poorly written, canned, response in return which did not relate at all to anything I had said. This happened again following two more follow-up messages. Either they were not reading, or could not understand, what I was writing. Angry at this point, I sent another message, including all the previous messages and replies, bluntly asking for this message to be delivered to someone who spoke English and could actually read what was sent. To my surprise, I received a response saying it was being sent to the software developers who would respond in detail. However, a few days later, I received a message stating that, since I had not contacted the company in some time, my problem had apparently been resolved. Of course, it had not been resolved - I was still waiting for the promised response. I gave up at this point. I never did receive a response from the software people, nor has the issue been resolved to this day. This company has apparently outsourced their customer support to a third-world country, using employees whose command of the English language is questionable at best. This was insufficient to handle even a relatively minor issue like mine. Further, I'm not exactly thrilled about the loss of American jobs as a result of overseas outsourcing (obviously "American" is only good enough to use in a company name). Therefore, since I'm buying a new computer this week, I'll look for another company who takes customer support, and American workers, more seriously. I urge others to consider the same option. I don't own this specific APC product, but I do own other APC products. My home was hit by lightning on July 2, 2004 during a severe lightning storm. Both of my garage door openers were destroyed during the strike and they were on separate NET3 power line surge protectors made by APC. NET3 surge protectors offer the best ($50,000) damaged equipment warranty that APC offers. APC refuses to pay for replacement garage door openers since in their determination, the surge protectors are functioning properly (I had to send the surge protectors at my expense for analysis at their labs). I will never contend that a surge protector can protect any device from a direct lightning strike, but the APC warranty contends that they will replace your equipment in the event this unfortunate event occurs. I now do not recommend APC equipment, since their warranty is worthless. This power supply will run my equipment for 21 minutes, more than long enough for me to switch to a back up generator.If I ignore the power outage, it automatically backs up files.In addition, it will kick in for low and high voltage conditions, and bridges those annonying one and two second outages that cause reboots.All in all, it is a real convenience. And the alarm CAN be controlled.It can be shut off entirely.It can also be set to remain silent when the PC is off or hibernating. It can also be set to remain silent between a given hour and another given hour. Mostly, this is great.You get a reasonably powerful backup system, software control, and even a nice power strip.With its 500VA rating, you'll have plenty of power to ride out a short outage, and plenty of time to safely shut down in a longer outage.It's easy to set up and works great. OK, here is the key flaw.This unit is advertised as being a great item for home or home-office computers.Problem:Its alarm starts to beep - quite loudly - ANY time the power goes out.I find this really inappropriate for a piece of electronics.My power is reasonably reliable, but like most people, we have occasional outages.In fact, my local utility likes to service the lines in the middle of the night. Do I really need a loud beeper to wake up the family every time we have a 10 minute outage at 3am? In the air, on the road or at the office, powering your mobile gear just got easier. Self-contained in its slim carrying case, Juice energizes and recharges mobile equipment anywhere, anytime. Auto, air or standard outlets, Juice connects to them all-eliminating the need to carry multiple adapters. And with its optional accessory, Juice simultaneously powers a mobile phone or handheld in addition to your notebook-supplying continual power with built in safeguards. So take off with the power of Juice. Grounded in innovative design, it's clearly the complete energy source for mobile computing. * Sony Playstation Portable - perfect for long flights and settling down before going to sleep in the hotel... beatiful video games in the palms of your hand (also plays music and video if you want). Thanks to Ken for the reco - I love this thing! * HP/Compaq laptop - normally my corporate issue NC4000, but sometimes our personal zt3000 as well. iGo is distributed by a fairly small company called Mobility Electronics (sometimes products sold under "xtend micro products"). They have focused on the niche market of portable power supplies - and they do this with excellence. There products allow you to power your devices via AC (both 110v & 220v), via airplane in seat power, and in your car / cigarrette power adaptor. 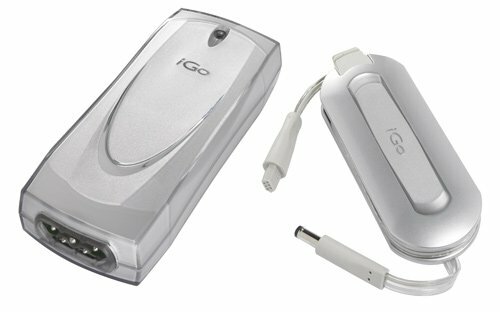 The iGo product offering consists of a power brick with wall-to-brick to cord, and a wall-to-device cord. To make the device work, you connect a "power tip" at the end of the wall-to-device cord. Each notebook computer has a speciallized tip, and sometimes a notebook manufactur will have 2 or 3 different tips... so be sure you have the right one. If you buy the iGo 7500 (I bought the iGo Juice - but these are pretty much the same products), you get the brick, wall-to-brick cords (both AC and airplane in-seat and car cigarrete lighters), brick-to-device cord, tips for common laptop models. 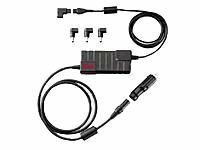 * PS0055-11 - the base Juice system - includes main power brick, US-standard wall-to-brick cord, auto/air connector, brick to device cord, standard notebook tips (make sure your notebook uses one of those, or buy the necessary one). * 6620012 - European power cord for the Juice system - use this instead of the US-standard 110V cord. I have also purchased a Targus Universal Power Travel Adapter (Model # PA033U) to help me convert plug sizes for the United Kingdom (220v but different pin-out, Switzerland (European standard round pins but smaller in size)... so I am set for anywhere in the world. All the iGo parts + the Targus adaptor fit into one fairly durable bag that iGo provides to you... I leave this bag packed all the time, and when I depart for a trip, I grab my "iGo" bag... and I know I have all the parts that I need to meet my power needs for all my devices anywhere in the world. Before I buy any new portable electronic device, I check to see if it is compatible with my iGo... if it isn't, I don't buy it (my digital camera is not compatible - it was purchased before the iGo - so the camera will probably get replaced soon). I highly recommend this product. The Good:It has worked for me in AC wall outlets, with appropriate plug adaptors, in the Ireland and Italy (as well as in the USA and Mexico without plug adaptors) with my Sony R505 and my Apple PowerBook G4. The Bad:It will not even light up when plugged into the cigarette lighter in my Toyota LandCruiser, nor would it light up when plugged into the laptop ports on Continental 767s and 777s or United 777s or Alitalia 767s or 777s with the same two laptops (Sony R505 and Apple PowerBook G4).Note that Continental and United 757s (and several airlines' 737s, 319s and 320s) that I have flown on do not have the power ports at all, so the Juice was useless on these planes anyway. On one Continental 777 I asked the flight attendant how to get the Juice to work in the laptop port.She tried it on my laptop, and those of two other passengers on the plane who were using Juice with their laptops - and mine would not work with any of theirs.She tried switch parts out, and my Juice finally worked with THEIR cable.So when I got home I ordered a replacement to the cable section that she had switched it with - and it still has not worked on yet another Continental 767, or in my Toyota's cigarette lighter adapter. Another passenger on the Alitalia 767 said that he had the same problem with the iGo Juice and instead uses the APC auto/air adapter, and has used it with no problem on various Alitalia and British Airways planes. I even tried getting another iGo adapter - the iGo Everywhere - and it would light up in the cigarette lighter of another car, but would go out as soon as I attached either of the laptops.So I returned that iGo immediately and am looking now for a battery pad, or maybe to try the APC auto/air adapter. This adapter is a great idea and wonderful when it works. When I put all the cables back into the back I find it's a lot less bulky then my regular adapter. And it is so cool to be on a plane and charging both my computer and phone at the same time. But the design is bad so they break quickly. With my first one I would occassionally not put it back in its case but instead would just throw all the cables into my backpack if I was in a rush. Eventually the tip of the cable (not the removable tip) broke and it stopped charging. It's too bad as it is a cool product idea. If you get one you'll love it at first. But don't expect to get more than about 20 uses out of it. I've had the iGo Juice 7.0 for a little over a year, and it's worked out perfectly. I typically use it to power my IBM ThinkPad R40 using AC power, and occasionally run it off of DC in the car or on an airplane. Having adapters in the carrying case for many types of notebooks has helped me help others when they've forgotten their own power supplies. One year and the thin wire got cut. The twin prongs just can't hold the big white block to the socket when plugged into the wall if yanked a bit. Buy 3rd party on this one. Apple's ibook adapters are horrible quality. I have had my ibook for a year and a few months now.The first power adapter that came with the machine broke after 8 months.It just broke away at the conector part to the plug that goes into the computer, the part with the ridges.I had to buy a new adapter and was very careful with the delicate thing but yet the tip of the plug came right of last week.So now I have to buy another one, for nearly 100 bucks.After paying 150 for getting my ipod fixed which has a delicate lcd screen I am getting sick of such delicate parts that apple makes.They need to build a bit more stabilty into their products. Amazon has this product over-priced. This item is about 30% less pretty much everywhere else you look. Their "sale" price is the same as everyone else's retail price. After about 3-6 months of use, I could see that the adapter was beginning to tear. I was able to glue it back together for about 4 more months. Then it started to tear again. I had to buy another after-market adapter for fear that I would be without power to my vital laptop. I am very gentle with the adapter because I have read lots of reports that the adapters break. They will even with proper care. The wire going into the laptop is just too small. The design of the adapter is very nice, the cord is very long and like that it has an exchangeable plug that will go directly into the wall. It gets an A+ for style, but a D+ for design. Apple can easily fix this in future versions just by making the end of the plug thicker and stronger. After 6 months of use I"ve managed to sever the tiny wire from Apple's cute little adapter with its "stowaway" prongs (believe me, no heroic effort required).So now I'm down to less than 2 hours of battery power and 6-8 hours of word-processing before tomorrow's class.Okay, it was my fault, and I"ve got enough juice left to order a new one from Amazon. No big deal. But what's this?I was expecting to spend ten-fifteen bucks!At least there are cheaper, more rugged alternatives. In this case, substance beats out style. True550 is a 550 Watt 6-output, dual fan-cooled ATX (Baby AT or PS/2 Size) power supply designed for personal computer or industrial applications. I previously bought a 550w generic power supply thinking that my computer may require more power. After installing it, I realized some things did run better. But after 1 month the power supply went dead, so I got it exchanged (unfortunately for the same kind). Something like this happening to a power supply while the computer is running I would think could have some kind of negative effect on your computer. After reading various articles and magazines I realized just how important a quality power supply is. So I decided to get this Antec PSU. I've seen their ad in magazines and it seemed pretty good, plus Antec is supposedly a very good brand name. One of the main points of the power supply is its silence. Previously, after buying the generic 550w my computer's noise was annoying, it just kept too much noise. After installing this Antec, I was absolutely amazed at the silence of my computer. The only way I could tell it was on is by coming within 3 feet of it. There is hardly a difference in noise between it being on or off. This is more beneficial than you think, with less noise circulating in the room, you can hear sounds, such as the speakers, better. The power supply also works very well. It has allowed me to overclock my system to a much higher stable speed than before. Everything also seems to work perfectly now. There are also many different power connectors, including two fan specific power connectors that control case fans depending on the temp, plus SATA connectors and the standard ide. With all the connectors the system can become a bit crowded but its not a serious problem. I was also a bit short on ide connectors, but thats only because I have seven devices which use ide connectors. Many people think of a power supply as one of the least important components of a computer but its actually one of the most important, so do you and your system a favour and buy a quality power supply. Try to overlook the price, a high end graphics card is way more anyway. Plus after spending alot of money on your system I'm sure you want to protect it. You can't go wrong here. Antec PS has one of the best reputation. You can verify this by checking out their various reviews.When they rate their power supply, they give you the actual operating voltage for each connectors. This is not like the other PS that label a certain wattage, but are the maximum allowable load - not nominal (real-life) handling.While Antec really has more reserve power than their announced 550W. Why this much? These days 550W isn't overkill anymore. Don't starve your peripherals with the needed power. You'll be keeping this for a long time. The motherboard and CPU is the heart of the PC. So if you consider that their operation depends on the amount of power supplied to make them function, then you'd have to think again. Giving them CLEAN, CONSTANT energy means STABILITY for your system. This unit has all the necessary connections you can ever think of, and you can't possibly fill up.But do heed their warning on the allowable maximum connection per strand of wire, which is 3 each.If you need to connect more peripherals, just use another strand.That's to ensure each component gets their proper voltage. The only thing this power supply lacks is the new Serial ATA connection which isn't a problem since there are cheap 4-pin to Serial power adaptors in the market - also included with retial Serial ATA hard drives and motherboards. Lastly, the PS is very quiet.The only sound I hear is the fan from my CPU.A real treat.Enjoy! The good: has more connectors than you'll ever need (9 for IDE HDs and CD-ROMs, 2 for Fan Only) and can supply all the energy for the most power hungry systems - and nobody will hear it because it's more silent than the HDs. Looks nice too (of course, anyone who wants a power supply for the looks should try Antec's True Blue, although that only supplies 480w, it still is more than most will need). The bad: the price? Yeah, but anyone spending big bucks on a mega-ultra-fast video card, a ultra-high-speed processor, a hyper-super-incredible motherboard and stuff should not rely on a El Cheapo Power Supply. I brought this p/s because it was what I needed. A smaller 430watt or 480watt p/s may do the job, but I wanted the max... and Antec true power was the best for the price. Running RAID with six hard drivers, CD burner, DVD burner, 7 Fans, lights and overclocked Ram, CPU.. I had to make sure the p/s is up for the job. To my surprise True power 550 had Fan Only connectors. Not only the p/s was silent, the fan only connectors made my whole system more silent then my old system. Which only had 2 80mm fans. So I highly recommand this p/s for anyone who has all their bay filled... and need a silent pc. ...until [people] ditch the ATX spec.Obviously that won't happen anytime soon, but it will happen eventually.Seriously, though - if you run a very busy system with two or more hard drives, multiple expansion cards, and high-end CPUs (or more importantly, overclocked CPUs), it's always nice to have some overhead available. True430 is a 430 Watt 6-output, dual fan-cooled ATX (Baby AT or PS/2 Size) power supply designed for personal computer or industrial applications. I think this is a very good power supply. It's pretty quiet for one with two fans - I had a generic model with two fans before this one, and this is half as loud as that one. I read somewhere that this was tested up to more than 500 watts and didn't break down or anything, so even though I don't plan on attempting to blow mine up, it's good to know that it's stable. It also has a port in the back so you can plug in drives and fans to see if they power up or not. That's pretty useful to me since I'm a do-it-yourself-er when it comes to computers. My only grudge with this power supply is that I could live without the onboard fan controller cables, and would rather have more regular power cables. My computer is set up so I control the fans (mainly based on how quiet I want it) so I don't need the automatic controller. The charger is ENORMOUS. At least twice as heavy as the OEM IBM charger, and weighs more than the IBM, Sony, and Dell chargers added together. The cords are thick and extremely long. This is not the charger to bring on a trip. The plug is a three prong plug which usually creates significant problems in a lot of foreign countries if you want to use plug adapters. You can buy cords to fit some plugs in foreign countries from IGO, but they are fairly expensive. Further, the cord to the IGO charger is, of course, proprietary - lose it and you are hosed. It didn't work with the Sony phone at all. With the IBM Thinkpad, it charges the laptop when its in hibernation or off, but it doesn't work right if the Thinkpad is on - it switches off and I have to unplug it and plug it in again. It works fine for the Dell. I'm not exactly sure who this is targeted for - its nice that I can plug in two devics at once, but at home I don't mind having everything plugged in with its own charger. This is WAY too big to carry on travel. I can't even imagine whipping this sucker out in the airplane to charge my laptop. I've switched back to the OEM cable and two charge-and-sync USB cables for my phone and PDA that I found on the internet. The sleek industrial design of the power unit belies the heavy-duty industrial "design" of the wires that connect to it: they are thick, heavy, and inflexible. While other laptop adapters can manage with a thin AC cable and two-prong plug, the iGo uses a heavy cable with giant plugs at each end that would be better suited for powering a refrigerator than a laptop. The same is true of the power output cable: an unecessary heavy braided shield visible through the thick and low-flexibility PVC insualtion makes that cable hard to use.I've often had the adapter tip pop out of its socket on the laptop because the cable doesn't bend properly. The power part works great, but I wish they'd offer replacement cables. While the iGo 7500 does everything it's supposed to do (if you carefully read the specs), it is not the panacea for business travellers that it is advertised to be.Granted, the sleek silver "brick" replaces at least two adaptor bricks that you would otherwise be carrying: the AC adaptor for your laptop computer and the airline/car adaptor for your laptop.It also accomodates an additional, smaller device (though the "tips" for these smaller devices must be purchased separately).Tips are available for iPods, digital cameras and many mobile phones.You can charge your laptop while also charging the secondary device.However, I found that trying to use both devices while plugged in caused the iGo to overload and power down.Thus, running a laptop and an iPod simultaneously will not work.So far, I've replaced 3 power devices with about 1.5 (as the "secondary" power adaptor that plugs into the iGo is about as large/heavy as the iPod's AC adaptor. The really disappointing aspect of the iGo is its lack of "tips" for a number of common devices that I carry with me.In particular, no tips exist for my Blackberry, my portable HP 450 printer or my JBL iPod portable speakers.Thus, I still have to lug around power bricks for these devices.I had hoped that the iGo would have replaced all of these with a single power supply, but it was not to be.Perhaps more tips will be added as the device gains popularity.I have certainly registered my request with the company! 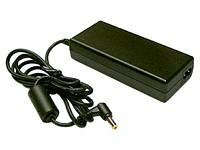 Every time I get a new laptop, phone, digital camera, pda, mp3 player or any peripheral for my computer I end up with another power brick. Should I also want to charge said new laptop etc. in the car, on a plane or while traveling there are accessories available but they will cost me extra. You can also be fairly sure that your new laptop will have a different propriety power connector than your old laptop uses. I have a box in my basement full of once expense, now useless power supplies and adaptors for cars etc. It's is such a waste that the electronics and computer industry could easily do something about if they chose to adopt a common standard but that's unlikely to happen as the accessory market is such a cash cow to the industry - environment be damned. The iGo Everywhere 7500 attempts to address this issue. The stylish power adapter will run your laptop at home, on the plane, in the car and abroad while traveling In addition you can simultaneously charge your phone, camera or pda if your device is supported. The modular system works well. I never thought I'd get enthusiastic about a power adaptor the the concept and execution is solid. Choose the correct tip for you device and you can then leave the OEM power brick at home. The only downside I have found so far is the lack of iTips available for the devices I own. E.g. a few Sony digicams are supported but not my F717; some mp3 devices are supported but none of the best selling Creative line (Nomad, Zen, carbon, etc.). Hopefully more of your devices are supported than mine but all the rest of us can do is wait until iGo choose to support our devices. I have tried contacting them about this just to find out if there are any plans or a schedule for releasing other iTips in the future; support just told me to subscribe to their newsletter but couldn't even tell me if my devices were being considered. Come on iGo; if you want to be THE comprehensive, portable power solution then support more devices please. In conclusion; this is a quality piece of kit that makes using your laptop away from home very simple. I've enjoyed relegating my laptop's power supply to the fore mentioned box in the basement. I just wish I could do the same with the power supplies for my camera and mp3 player as iGo's advertising suggested I would be able to. I travel with a notebook and a cell phone. This unit allows me to use/charge both in car, plane, at home, and at the hotel. Bulky, heavy, ugly...SAVE YOUR MONEY! I thought this was a good idea. The Apple adapter for my 12" Powerbook overheated and died (my first "failed" Apple product), so I decided to play it safe and buy another brand. The Kensington adapter could charge in a car, on a plane, and at home, so I figured, what the heck. What a disaster. It charges fine, if a little slow, but it is so HEAVY and so POORLY DESIGNED, I cringe every time I have to use it. You need to uncoil two heavy cords (wrapped with velcro that sticks to the other cord, making for a mess of wires in your bag) and plug each into either side of this big white brick. Kensington obviously thinks a cool blue light on the brick makes up for the ugly cord issue, but there is no indicator light showing when the charge is done, like Apple has. The cord wraps neatly onto Apple's adapter, and you don't even need to carry the extension cord if you don't want to. Also, the combined length of the 2 cords and the big white brick in the middle is still much shorter than the Apple adapter + extension cord. I hated this so much, I went and bought a replacement Apple adapter after all. Why can't products work as well as Apple's? DO NOT BUY THIS PRODUCT, unless you plan to leave it plugged in at home for convenience. I purchased this to expand the usefulness of my G3 iBook. I really wish I hadn't. The interchangeable plugs seem like a great idea, but the plug is significantly heavier than the original iBook power adapter's plug. It placed too much strain on the laptop's power port, and eventually caused something internal to snap, leaving me with a G3 paperweight. Lifesaver for long car trips! This product preformed as expected, that is, perfectly. I plugged it into the car and the adapter into my iBook G4, and it worked just fine. It appeared to charge the iBook as well as support its power draw. I don't know the technical specifications, but I know one thing: it worked. It was very useful and allowed me to not be concerned about battery performance in the car. However, despite the perfect performance, there was a small issue with setup. I would guess that the power adapter plug that goes into the iBook G4 was actually designed for the iBook G3, because the adapter does not fit snugly. While the power adapter for the Apple supplied charger fits right in, the Kensington adapter leaves a few millimeters of the plug exposed. Additionally, there is no LED on the plug itself, so I have no idea if it is done charging or not (there is a one-color LED on the box of the adapter, but this does no indicate if the battery is charging or not. Dimensions: L5.9" x W5.5" x H3.4"
Antec makes really great quality products: computer cases and PC power supplies. The smart power supply runs quiet at normal conditions. The power supply can sense the temperature changes and adjust the fan speed automatically to keep the computer cooler. SL350 has to fans: one 80mm and one 92mm, both are running at a slower speed at normal conditions to keep the mechanical noise lower. All components are housed in a heavy duty case. It's really a quality product! Manufacturer tech support and customer services are GOOD! PC enthusiasts and reviewers agree: TruePower is Antec's most advanced line of PC power supplies, with over 45 worldwide Editor's Choice or "Best Buy" awards and counting. The Worldwide Leader in Silence and Performance. Thanks to Antec New Low Noise Technology, system noise is substantially reduced, too. The power supply fans run at the lowest speed appropriate to load and conditions, controlled by an advanced temperature response system that outperforms previous solutions. Dedicated Fan Only power connectors allow TruePower power supplies to control the speed of case fans, too, thus reducing total system noise. Dedicated output circuitry for each voltage output, overcomes the limitations of combined output of traditional design. Get all the power you need when you need it most. Antec Low Noise Technology achieves the optimum balance between noise reduction and necessary cooling. ATX12V for AMD and Intel based systems including P4. 2 Serial ATA drive connectors. Two double ball bearing fans. Dedicated output circuitry for each voltage output. Need True Power? Want A REAL Power Supply? This is IT!!! Antec is one of the few and only makers of True, Real Power Supplies. This monster 480 watt PS is stylish right out of the box. Two bright, oversized blue LED's light each fan giving the impression of four LED's, (one 80mm the other 90mm), fan cool the unit very effectively and give a welcoming glow. Cables are pre-sleeved with black mesh nylon and have plenty of length to reach. Unit runs Very Quiet day to day and never has a problem with loads. Fans look good and match perfectly with my PC case; black case and blue lights all around. I have used Antec for many years now, (5yrs+ total) and have not once had a problem. If you compared Antec to other "so-called" Power Supplies that weighed only half a pound, even the 350 watt Power Supply from Antec will give you a Hefty 350 watts of true power to run your PC flawlessly! This Power Supply even includes two built-in SATA connectors for easy use of SATA drives, but still gives you plenty of standard Molex connectors and two floppy connectors. As well the back end of the PS includes a standard female Molex connection for everyday uses; example, you can hook up hard drives externally, plug in fans, etc.... Not to forget the PS also has a toggle switch built in for ease of use when doing maintenance on your PC without having to unplug the power cord. On top of all this, Antec also has a dedicated power connector just for case fans; this allows the PS to control the speed of the case fans based on its temperature, thus lowering noise even further. Antec has done it again with the help of Amazon! The only other Power Supply I could recommend from experience is the Vantec Stealth (VAN-520A). But for the price $86, this is a steal! Don't hesitate to buy this if looking for a Real Power Supply at a low price. The ANTEC TrueBlue 480W power supply is a great choice for anyone.Besides the dual blue LED fans, this power supply has 2 SATA power connectors and 2 FAN only power connectors. Additionally, there are a host of molex connectors for your non SATA drives and optical drives, as well as your floppy drives. Interesting there is a female molex connector on the back of the power supply.I have't used it, but I imagine it may have some sort of use. The blue light lights up the case well.The only complaint, I have is that there doesn't seem to be a way to turn it off.Also it would be nice if it was offered in colors other than blue. 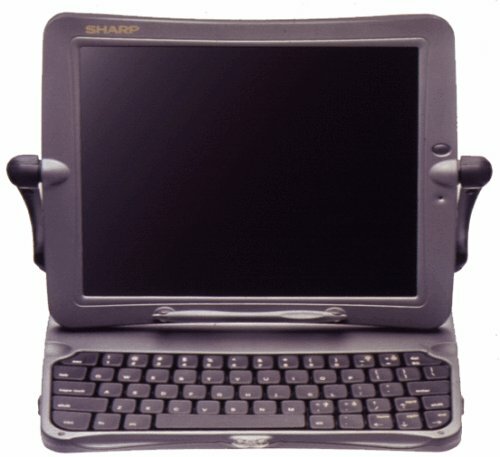 The Sharp Mobilon TriPad PV-6000 has the features and specifications of a handheld-class device but has the look and feel of a notebook PC. Loaded with software, the TriPad connects to your PC through a travel dock via the PC's 9-pin serial port. The TriPad has three modes of operation--conventional notebook (clamshell), writing tablet (slate), and presentation display (easel)--depending on how you open and fold the TriPad case. The TriPad is ready to go as soon as it comes out of the box. All we had to do was charge the battery pack (already installed) and install the software on our desktop PC. When testing the TriPad, we found the keyboard so comfortable and the display so large and bright that we easily forgot that the TriPad is a Windows CE-based handheld, not a true notebook. We also installed and tested the Jot 2.0 handwriting-recognition software (15-day trial version). The software takes a little getting used to, but it is flexible and trainable, and you can actually write quickly using the stylus on the TriPad's wide touch screen. After an initial battery charge, we did all of our tests without the AC adapter and with the Tripad set to the brightest screen setting over a period of about seven hours. At the end of our testing, the battery level indicated about 25% power remaining and the TriPad was still fast and responsive. With its VGA touch screen and stylus (which makes a great pointing device for activating links on Web pages), comfortable keyboard, sturdy and attractive design, and long battery life, the TriPad makes a great low-cost alternative to notebook computing. WOW!!! BEST PURCHASE I HAVE EVER MADE!!!! I just bought this thing from Amazon and all I can say is WOW!!!! This is probably the best purchase I have ever made. This thing is everything I ever expected and more!! It's easy to use as well - even my wife can operate it! I have to say, everyone out there who is thinking of buying this, stop thinking. I bought it and I am extremely happy with it the moment I powered this thing on. YOU ABSOLUTELY POSITIVELY CANNOT GO WRONG WITH THIS PURCHASE! I GUARANTEE IT!!! The best thing about this is the design, but the arms connecting the screen and keyboard look odd when the unit is closed.The screen is fairly dim, and must be used in a dark/moderately lit room.The viewing angle of the screen is horrible; the only position you can see the whole screen without an inversion/blackout effect is at an angle where any overhead lighting glares all over the place.The CPU speed isn't particularly slow, but the graphics ([re]drawing the screen) goes on at an awful crawl - i.e. it's no good for graphical things.Now I must sound entirely bitter and biased against this machine, but I'm not, I carry it in my bag all the time and use it when I can.I even use it as an electronic book, its best use so far. Let me state first off that I love(d) this machine! It is light-weight, easy to use and interfaces superbly with your desktop or notebook. That said, I feel that I need to warn you that in 1 year, I have had to return my machine 4 times for the same repair. It freezes, won't shut off, then after a hard reset, won't turn back on. Sharp has replaced the battery, the main chip and the inverter, now is going to charge me [alot] to fix the machine! I was considering buying a new one, until I talked to my Dad who also bought one at my recomendation and found out that his is doing the same thing. Obviously, I didn't get a rare lemon. Take a chance if you must, but I am steering clear of this wonderful little computer until they fix some major problems! I have had my Mobilon for a year now and I still love it. As a professional journalist and technical writer, this little PC has made me more productive and efficient. Rather than using a notepad and pen, I bring along my Mobilon and essentially take dictation from interviewees. With applications like Pocket Word, Excel and PowerPoint, it snycs beautifully and easily with my desktop for more technical applications and the 12 hour battery life is fabulous! It also syncs with Outlook so I have all my contacts and my schedule with me. The touch screen technology and built-in handwriting recognition software mean I don't have to find a surface for a mouse and I can take notes or draw figures with the stylus. The monitor resolution is very clear, though hard to read in bright sunshine, so don't take it poolside. Color and grahics are very good, though you are limited when it comes to your choice of fonts--not a critical item for me. I have small hands, so I think the keyboard is big enough for me, though some people have commented that typing on it is awkward. I disagree. Of course, you can download or buy lots of great software from Bubblet (TM) to finance and utilites, so the sky's the limit for how you decide to use this impressive little machine. If you are looking for a laptop that doesn't weigh seven pounds but is powerful enough for Word documents, spreadsheets and more, the Sharp Mobilon is for you. Do I love it or hate it ? 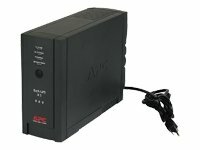 APC's Back-UPS LS 500 offers rugged and remarkably stylish power and surge protection for high-performance computer systems. With seven power outlets (four battery plus surge and three surge-only), two-line fax/modem protection, and easy-to-use software for file saving and auto system shutdown, the LS 500 provides complete computer-system protection. Measuring just 5 x 9 x 8 inches (W x H x D) and weighing a mere 16 pounds, the LS 500 provides a lot of backup for its size. Dataline protection covers RJ-11 modem/fax/DSL protection (four-wire, dual lines), and the surge-energy rating extends to 420 joules, handling surges, spikes ,and even lightning (guaranteed). An overload indicator notifies you when the UPS has too much connected equipment for its rated load, and audible alarms and status LEDs notify you of changing UPS and utility power conditions. A cold-start feature lets you power on the unit with no input power, providing temporary emergency battery power when the utility power is out. Typical backup time at half load is 14.1 minutes (157.5 watts), and typical backup time at full load is 3.6 minutes (315 watts). Automatic voltage regulation (AVR) corrects low-voltage conditions without draining the battery, while the unit's space-saving, ergonomic shape makes the unit easy to use and manage. Its outlets are conveniently located on top, and the alarm indicators are visible from any angle. The LS 500's transformer-block spacing is designed to allow use of up to two transformer block plugs without blocking access to other outlets. USB 2.0 compatibility and connectivity ensures quick and easy installation of the included APC Shutdown Manager PowerChute Personal Edition software (for Windows 98/Me/XP/2000 and Mac OS 9.0.4 or higher). The three surge-only outlets offer protection for non-data sensitive equipment like scanners and printers without reducing the unit's available power or battery capacity. This helps to maximize battery power for equipment that needs it most like a computer and monitor. The unit's use of a push-button circuit breaker instead of a standard fuse eliminates the need to return the unit to the factory for service. Microprocessor-controlled battery charging and diagnostic testing ensures maximum battery life and intelligent battery management, while a replace-battery indicator warns you when to charge or replace the battery. 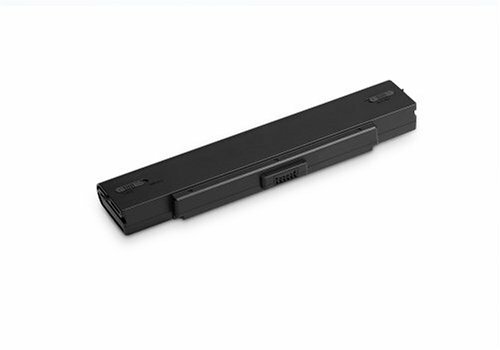 Using an optional replacement battery, you can even change the LS 500's battery without powering down your equipment. The unit uses a leakproof, maintenance-free, sealed lead-acid battery with suspended electrolyte. The UPS also offers a $25,000 lifetime equipment-protection policy, free trial offers of anti-virus, e-mail privacy, system recovery and firewall software, as well as a data-recovery warranty provided exclusively by Ontrack Data Recovery Services. Optional batteries include the CURK2 APC Charge-UPS Refresher Kit number 2 and RBC2 APC Replacement Battery Cartridge number 2. I bought this unit in September 2004 from J&R via Amazon, and the unit worked flawlessly ever since, and saved me a couple of time from power outage. I haven't used any other power backup device, so I cannot compare. However, I can tell that this unit works perfectly and is worth the money. i was worried it may be noisy, but it's not. i have a pentium 4, 17" monitor, two hard drives, etc. and it says i'm using 158-170 watts of power. this thing can handle a lot more than that. very happy with it. The UPS is simple, easy to install and the software is a delight, you can view and configure everything. 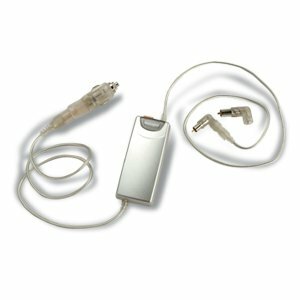 With the included USB cable, you can configure min and max normal voltage, view the UPS log, disable audible alarms during certain hours, and more. Definitively, the best UPS I ever had. Great for Mac OS X too! The manufacturer only lists software compatibility with OS 9. Guess what... Mac OS X (works great with 10.3) has built in support. Just plug it in to a USB port and it's available in the system preferences pane under Energy Saver. From there, you can set auto shut down and monitor the battery charge in the unit. This is definitely recommended for smaller computers/monitors or people needing short run time. I'm using it with a PowerBook so that I can gently spin down my attached external hard drives and still have protection for surges on the printer and speakers. You might want to consider the BackUPS Office 650 (Model #BE650BB) instead. You get considerably more run time and 2 more outlets (8 total instead of 6 total on this unit). I bought 5 of these for the computers in the house. I would have got better ones but the house has an auto generator so all I need is about 30 seconds of power. I noticed in another review the person saying there unit was going of and on battery mode even when the power was still on... To my understanding this unit detects (dirty power) and when it detects it, it will then stop accepting ac power. I think the software it comes with allows you to turn the feature off or even turn the sensitivity up. I bought one of these 10 months ago for my daughter's eMac. It has functioned well despite many power 'blinks' and short outages due to thunderstorms and such. I have a larger APS unit on our cable modem and wireless base station-equipped main home computer. 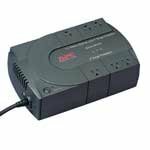 It provides the main backup and surge protection to our home computing systems. The BE350U would be a bad choice for a larger machine or a modem-using computer but for our sort of secondary computer situation it has worked well. The shutdown software kicks in when needed and we have never lost any files as a result. This power supply is a good purchase. It is indeed quiet, not silent, but quiet compared to older power supplies. It has some interesting features like SATA connectors for the upcoming generation of hard drives, and "dedicated Fan Only power connectors allow TruePower to control the speed of case fans, reducing total system noise." This feature is limited (in the documentation) to 3 fans though, so if you have more, you will have to connect them to regular connectors.